We're all familiar with the idea of virtualized computers. Not only are they a great way to better utilize resources in a server room, but they also allow you to create and destroy servers in the blink of an eye. That's perfect for a lab or training environment. Unfortunately, it's always taken a rack of actual hardware to create a training lab for Cisco hardware. Thanks to GNS3 (Graphical Network Simulator 3), that's no longer the case. 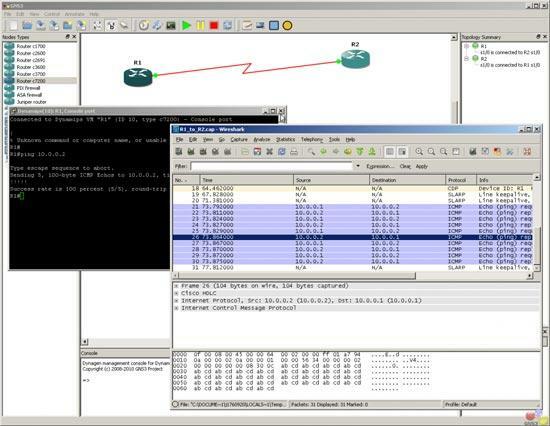 GNS3 is an open-source application that creates a virtual infrastructure of Cisco (or other) hardware. Not only can you watch the traffic flow, but you also can connect directly to the virtual devices and configure them like the actual hardware devices they represent. On the surface, it looks like a Visio diagram, but it's a diagram that actually does something! Whether you're actively trying to learn to use Cisco devices or just want to try out some networking scenarios, GNS3 is an incredible tool for sandboxing network hardware. It does require you to provide the IOS firmware (they can't provide Cisco's operating systems themselves), but that's it. It works under Windows, along with OS X and Linux. If you're interested, download a copy today at http://www.gns3.net.